Canterbury City Green Badge Guide course underway! We are delighted to have a group of enthusiastic and knowledgeable students on our new guiding course. 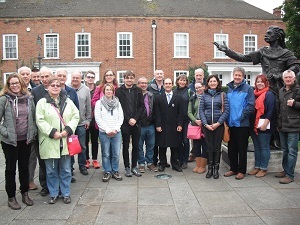 At the weekend our group had their first practical session with a city walk from Lady Wootton's Green down through Burgate towards Northgate, Blackfriars to the Beaney and into the High Street. A good time was had by all! Looking forward to the weeks that follow with site visits, lectures and of course more city walks! Register for your Big Weekend tickets!